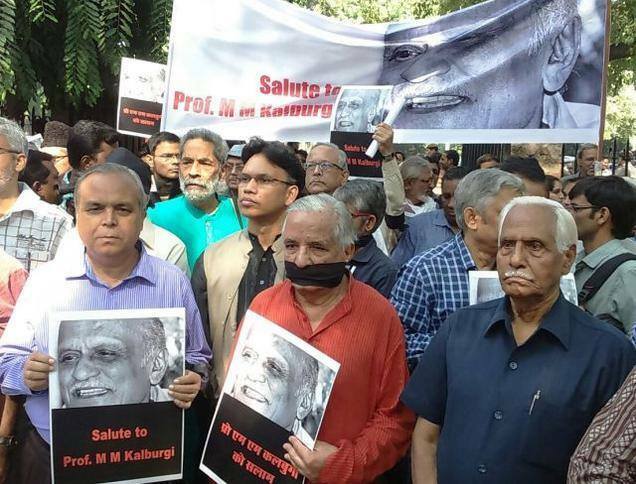 NEW DELHI: Breaking a steely silence in the face of unrelenting protests, literary body Sahitya Akademi has condemned the killing of Kannada Writer MM Kalburgi, expressing solidarity with authors and poets and urging them to take back awards they have returned. Concluding an emergency meeting today, the Sahitya Akademi took to pacifying eminent writers who have taken to protesting 'rising intolerance' in the country and spoken out against the body's silence. Ahead of the meeting, writers and their supporters held a solidarity march in New Delhi with black gags and arm bands. Writers from different languages converged for the silent march carrying huge banners from Sri Ram Centre at Safdar Hashmi Marg to the Sahitya Akademi building, where they submitted a memorandum to the Akademi demanding that it pass a resolution pledging to take stern steps to safeguard the freedom of speech and right to dissent of the writers. More than 40 writers from across the country had over the past few weeks announced their decision to return their Sahitya Akademi awards and stepped down from official Akademi positions to protest the "growing intolerance" in the country and fuelling an intensifying national debate. In the recent weeks, lynchings over alleged cow slaughter and beef consumption have been reported from several parts of the country; ink and paint attacks have taken place on columnist Sudheendra Kulkarni and a lawmaker from Jammu and Kashmir and over the last one year, three well-known rationalists, including Mr Kulkarni, were murdered. The government has shrugged off the protest by writers over the incidents with Union Finance Minister Arun Jaitley calling it a "manufactured paper rebellion".